High Country Conservation Center's 2014 staff from left to right: Jenny Hammock, Jessie Burley, Kevin Berg, Marty James and Jen Schenk. Soda Ridge trail maintenance with the Summit Mountain Bikers, 9 a.m. to 3 p.m.
Meet in Keystone at the west end of the Mountain House parking lot to carpool to the worksite. Shooting range sign installation with Summit Range Association, 9 a.m. to 3 p.m.
Meet at the Summit County landfill parking lot to hike to designated sign locations. The High Country Conservation Center (HC3) received the Colorado Association for Recycling’s Outstanding Outreach Award at the annual Summit for Recycling, held in Vail on June 8. 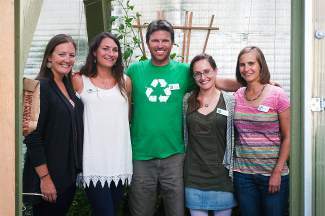 The award is given each year to a Colorado nonprofit that influences recycling and waste reduction in tangible ways through creative outreach and educational campaigns. HC3 was recognized for its education about High Country Compost in Summit County after the organization partnered with the Summit County Resource Allocation Park (SCRAP) to increase organic waste diversion through composting and to improve compost sales. The project was funded by a USDA Solid Waste Management Grant, aimed to establish markets for locally produced compost and to provide technical training and outreach to community members, professionals and solid waste managers. HC3 also provides hands-on education to K-12 students in Summit School District through the Composting in the Schools Program. Students learn about the importance of closed-looped systems and demonstrate composting by collecting food scraps during lunch. Student volunteers monitor waste streams to prevent contamination and educate their peers and parents about the importance of composting. Burley said she and the other HC3 employees were grateful to be honored for their work in front of a host of statewide recycling businesses, operators, government agencies and nonprofits. “We’re excited to help elevate the profile of Summit County’s zero-waste efforts at the state level,” she said. High Country Compost is produced at the SCRAP from sources that would otherwise end up in the landfill. Feedstocks include food scraps, beetle kill wood chips and biosolids. The compost facility is regulated by the state and the U.S. EPA, and High Country Compost is certified by the U.S. Composting Council as the highest quality compost available. For more information about recycling or composting in Summit, visit http://www.highcountryconservation.org or call HC3 at 970-668-5703. Conservation Colorado recently released its 2015 Colorado Legislative Conservation Scorecard. The conservation community’s goals for the 2015 state legislature were to keep Colorado at the forefront of renewable energy, promote energy efficiency, create innovative measures to encourage water conservation, and safeguard Coloradans’ access to national public lands. “Despite broad support for conservation measures, a number of priorities of the 2015 session, including increased energy efficiency in buildings and legalizing the use of residential rain barrels, failed to move forward at the hands of a few legislators in the Colorado Senate,” said Carrie Curtiss, Conservation Colorado deputy director. The 17th annual scorecard recognizes individual legislators for their ongoing leadership and those that stepped across party lines to further conservation. It also highlights key issues facing Colorado and provides an opportunity to see new champions emerge, especially women and Latino legislators who scored higher, on average, than their colleagues. The 2015 Colorado Legislative Conservation Scorecard provides Coloradans with a way to hold their legislators accountable for their votes during the 2015 legislative session. To view the scorecard, visit http://conservationco.org/scorecard2015. Send local environment news to reporter Alli Langley at alangley@summitdaily.com.